Swept out to sea by adverse weather, Captain James Cook and his ship, the “Endeavour,” failed to sight The Catlins coast, consequently the first Europeans to land there were sealers and whalers. The only record from that time is Captain Cattlin’s (sic) sketch of the estuary which now bears his name. He claimed a large area of land but was granted only a small block. For a short period whaling stations were based at Tautuku and Waikawa, and in 1844 the “Deborah” skirted the coast with several passengers landing at the Tahakopa River estuary, Tautuku whaling station and Waikawa. During 1865 the first sawmill was established, followed by others around The Catlins River estuary, while hardy pioneers established smallholdings which led to the first township of Owake (sic). Until the late 1880s The Catlins relied on its rivers where small vessels delivered supplies and loaded timber. Numerous wrecks occurred. As the settlement expanded and the bush was depleted around the estuary, the settlers clamoured for a railway. Started from Balclutha (1879), the branch line reached Owaka in 1896 causing the township to be relocated about 2 kilometres further inland. The line terminated at Tahakopa (1915). It closed in 1971 but linked The Catlins with Otago rather than Southland. The railway monopolised transport, carrying out immense quantities of timber until the late 1930s. Many sawmills operated, some moving south with the railway. Steam power improved their technology which relied on wooden rails to the end, however, from the 1920s motor transport opened up remote areas, such as Purakauiti and Chaslands. The last major sawmill closed in 1972. Pioneer farming was on 50 acre blocks held under long-term lease with right of purchase. Small herds of cows supplied many cheese factories or the butter factory in Owaka (1923-73), until all closed following a general conversion of farms from dairying to sheep farming. However, by this time much of the bush had been removed, not without trauma as bushfires got out of control, and extensive grasslands were created. Primitive housing quickly gave way to spacious dwellings as there was a plentiful supply of sawn timber. Most residents were staunch Presbyterians, but other denominations also demonstrated the faith of the pioneers. Public services included a manual telephone exchange in Owaka (1897), many small schools, post offices and bureaux throughout the Catlins, and a hospital in Owaka (1924-late 1980s). For many years The Catlins was a region of small self-operated businesses, but little urban industry. The hotels were important social centres, however they were stymied by prohibition (1894-1954) which resulted in much sly-grogging. 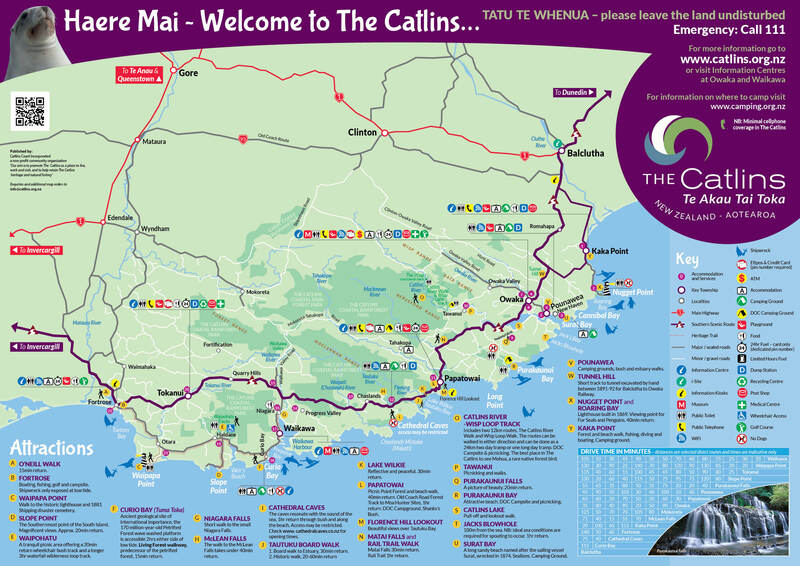 The isolated Catlins communities lagged in the provision of adequate roads. For a time the main road south was along Tahakopa Beach, and it was only in 1965 that Balclutha and Owaka were linked by a modern sealed highway, while the Southern Scenic Route was upgraded quite recently. The first settlers found dense bush cover and as it was cleared a Catlins landscape persisted – a landscape of gaunt dead trees, piles of semi-burnt logs, second growth, hollyhocks and weeds. A bracing climate and community spirit created people of fine character. Fortunately much bush south of Owaka escaped the full onslaught of the sawmillers, the result being the preservation of extensive scenic reserves and state forests. The area surrounding Waikawa Harbour has, since the naming of The Catlins State Forest Park in the 1950s, become part of The Catlins. It has a similar history to the region further north – a whaling station, sawmills, flax-milling, some goldmining, many small dairy farms, and a busy port at Waikawa. The entire region experienced dramatic farming changes in the late 20th century with amalgamations into larger units, sheep competing with dairy and beef stock, and quite recently the establishment of giant dairy farms with herds of 500 cows and above.